The Pauli Murray Project uses the legacy of this Durham native to examine the city’s lesser-known past, promote reconciliation and cross community dialogue and build a knowledgeable constituency for the proposed Durham history museum and Parrish Street Common Room. Drawing on the international ‘sites of conscience’ movement, we want to include in official history-telling more complex stories and use them to inform and enrich our community’s understanding of contemporary challenges, including persistent inequality and the racial divisions that mark daily life. 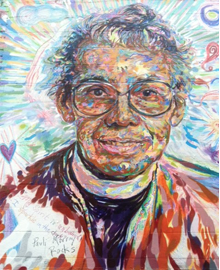 Ultimately, the Pauli Murray Project will help Durham reckon with and memorialize its multifaceted history and use it to establish a better foundation for positive change in the future. The project is sponsored by the Duke Human Rights Center at the Franklin Humanities Institute and named after the renowned historian of black America, John Hope Franklin. Please visit us at our website or look for us on Facebook. For more information, please contact Barbara Lau, balau@duke.edu.